In the fourth inning, the Firebirds were the first on the board after grounding out into a double play which scored a run, taking a 1-0 lead. The Whitecaps tied it up after Gage Workman led off the fifth inning with a solo home run. Orleans was back on the board in the seventh, scoring a couple of runs this time on a Spencer Steer RBI double, who later scored on a Jaxx Groshans single to right field. Brewster bit right back in the bottom of the inning. After Jesse Franklin singled to begin the inning, Hunter Bishop blasted one over the wall to tie the game at 3-3. Ray Alejo later added a solo home run in the inning, taking the 4-3 lead. The Whitecaps were able to keep this lead and take home the win. The Red Sox put on a show Sunday evening, collecting fifteen hits and scoring eight runs while keeping the Mariners to a minimum, allowing one run on five hits. In the first inning, Noah Campbell hit a two-run homer for Y-D to take the early lead. In the second, the Sox used three RBI doubles from Matthew Dyer, Zach Ashford, and Campbell to take the 5-0 lead. Harwich’s lone run came in the third inning on a Tanner Morris solo shot. This run was erased quickly in the fourth inning after Dyer scored on a Jonathan Deluca groundout to maintain the five run lead. Y-D received a couple more insurances runs in the sixth and seventh after Zach Zubia added a solo homer, then Zach Ashford singled to left to score their final run of the game. Wareham scored in all but two innings and did not need to bat in the ninth, easily beating Hyannis at home on Sunday. Austin Shenton started the Gatemen offense in the first inning with a two-run homer. After scoring on a groundout in the second, Wareham continued their scoring in the fourth. Ryan Kreidler led the inning off with a home run. Later in the inning, both Shenton and Pavin Parks added RBI singles to make it three runs in the inning. In the fifth, Oliver Dunn singled to center to score another. Shenton struck again the sixth with a solo home run, his second jack of the game. In the seventh, Jakob Goldfarb tripled to center to score a run, and later scored on a groundout to go up 10-0. Hyannis showed a little fight, scoring two runs in the eighth on a Todd Lott RBI single, and then using a balk to add one more. In the ninth, the Hawks scored three runs thanks to three different wild pitches, and then used a single to center from Brady Lindsly to cut the lead to four, but it was not enough. Despite the ten hits Bourne recorded, they could only cross two runs against Cotuit. Cotuit had fifteen hits and executed with runners in scoring position, scoring eight runs. 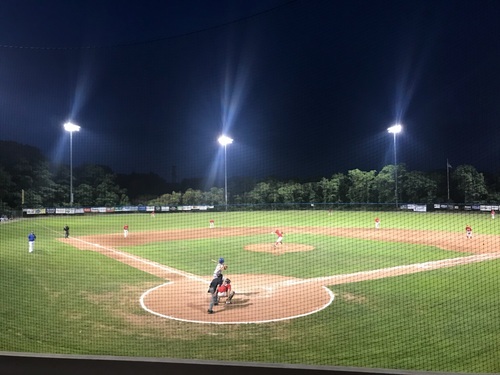 Up 2-1 going into the top of the fifth, Cotuit used five hits to score four runs including a Duke Ellis RBI single and a two-run triple to center from Peyton Burdick. Bourne got one of those runs back in the sixth on a groundout that scored David Langer. Two more runs for the Kettleers came in the eight on a Jonathan Robertson double that scored Zach Humphreys and Brady Smith to add insurance. After Chatham’s run in the first inning on a groundout that scored Blake Sabol, the Anglers were shut out. They held Falmouth at bay and looked as though they could possibly win the game 1-0, or buy themselves time to score a few more. But Falmouth’s offense clicked in the seventh inning. Kyle Stowers doubled to clear the bases and take the 3-1 lead. Matt Wallner then went on to score Stowers with a double. Cameron Cannon singled to left to drive in Wallner, taking a 5-1 lead. Falmouth added one more in the ninth on a Wallner single to right, wrapping the game up in fashion for the Commodores on the road.